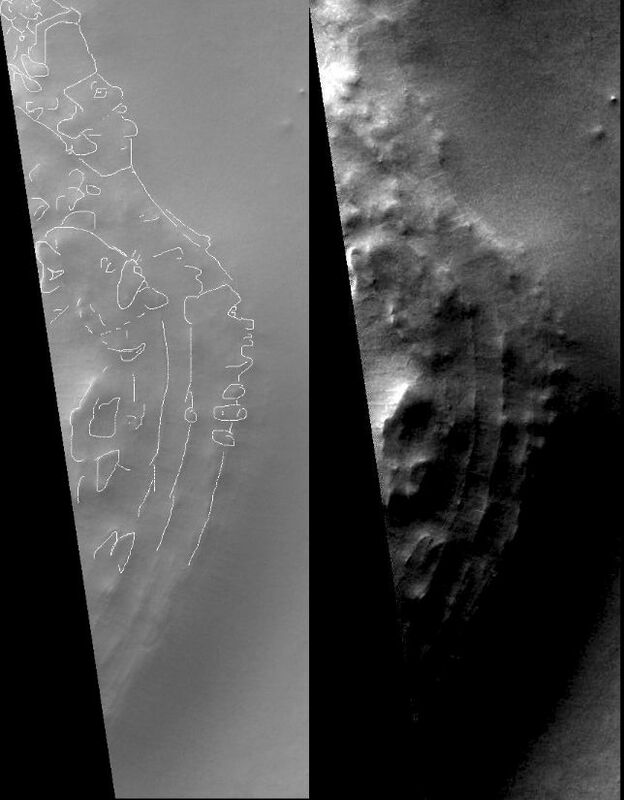 Located near the Barnard Crater in the Hellas region, raised areas produce the outline of two figures, a man with a tall hat and a feline. Both faces appear to be looking in the same direction, to our right, with their eyes gazing slightly upward. The upper figure appears to be wearing a hat, rotund, his torso protruding outward. The feline figure is located in the foreground below. He appears to be clutching a cane which stands before him. The image is located at longitude 299.59 west, latitude 61.80 south, and has a pixel width of 5.50 meters. 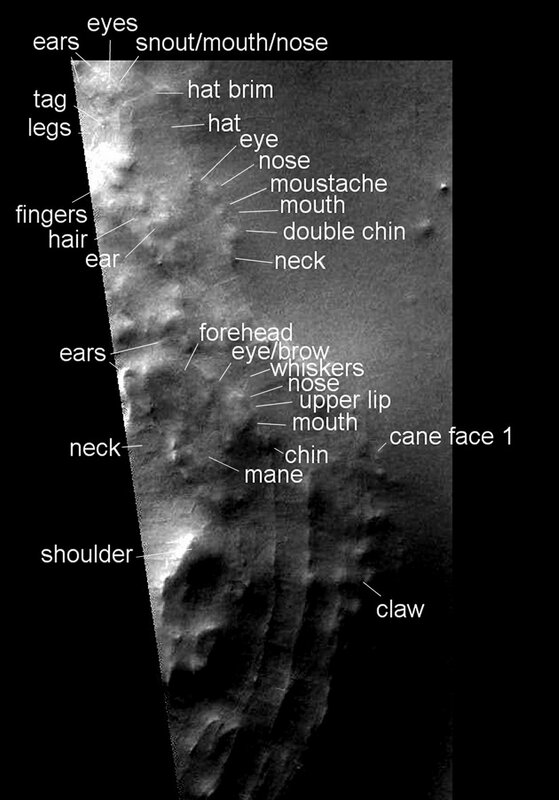 It was taken by the Mars Orbital Camera mounted on the Mars Global Surveyor. Given the image width of 2.83 kilometers, each of the two faces can be approximated to about 650 meters in width. The upper figure's hat appears to be a cross between the bicorn and shako worn by men in the 1800's. The figure has a nose, small moustache, mouth, double chin, neck, ear, and hair. The eye has two lids, eyebrow, a pointed oval lid aperture, a white sclera, the indication of an iris, and what could be perceived as a tear flowing over the bottom lid. The lower feline figure has two ears, a forehead, an eye, whiskers, a cat-like nose, a cat-like upper lip, a mouth, a cat-like goatee, a neck, and a mane. The back of the neck is visible as well as what might be percieved as a right shoulder. The right eye has some interesting details, the most prominant of which is the heavy brow. Not a perfect profile, a matching left eyebrow is visible. Some say this feline face has an intelligent look of relaxed contentedness.